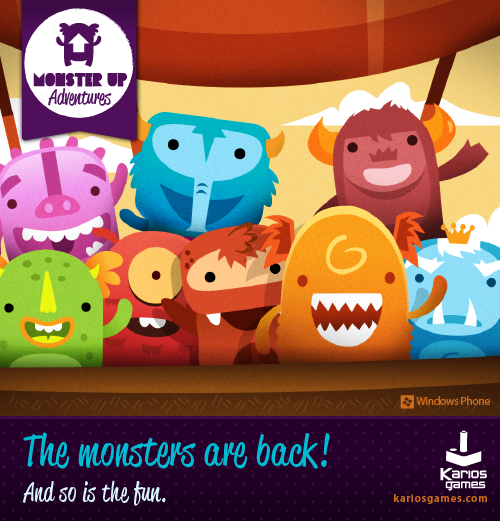 We've covered the popular "jumper" game MonsterUp previously on Windows Phone Central--published by Karios, the game features great music, bold, adorable graphics and interesting twists on an old concept. Though Doodle Jump gets the headlines, MonsterUp to us was always more creative. Now, Karios has returned with MonsterUp Adventures and we got a little sneak peek of the upcoming tile. Whereas before the goal was to just jump as high as you can, now on each level you need to "jump to the end" to complete it. It takes anywhere from 5-10 minutes per level and yes, it's quite challenging at times (especially on the 2nd half of the island). The collecting of jewels to purchase new monsters is well done as it gives you motivation to try new combinations, plus it adds to the replay value. The bosses, while not very difficult, add a nice break to the jumping and the exquisitely drawn and unique backgrounds keep the visuals fresh. Sadly, MonsterUp Adventures as submitted to be an Xbox LIVE game but was denied by Microsoft. Like Karios, we're not sure what the criteria is for making into that coveted camp but compared to the last few stinkers on Xbox LIVE, MonsterUp Adventures more than makes the cut in our mind. The plus side is MonsterUp Adventures will get to your phones sooner than if it were on Xbox LIVE and Karios can deliver more updates, more frequently. So our verdict? We really like this game. Jumpers are fun but they can get old fast. Karios Games have taken that concept to a new level with 'Adventures, breathing new life into the growing franchise. With fantastic graphics, a catchy tune and high re-playablity we're impressed.